With the feature film version of Alexi Pappas and Jeremy Teicher’s Olympic Dreams having recently premiered to acclaim at SXSW, we’re taking the opportunity to re-post this interview with the filmmakers about the project (then in web series form) originally published last year. 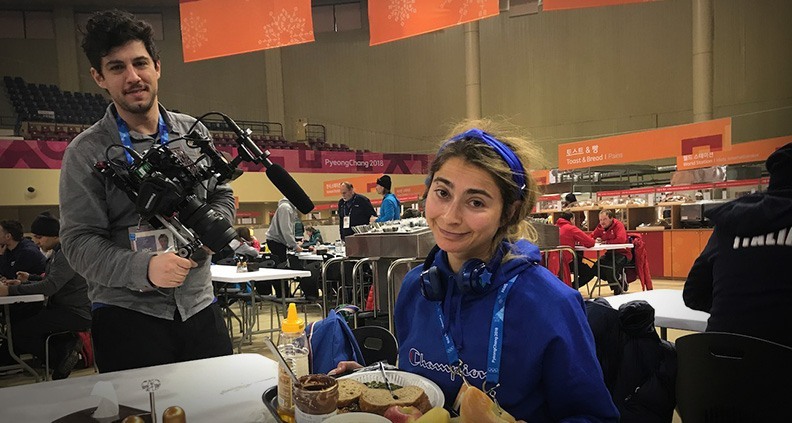 When Alexi Pappas and Jeremy Teicher’s Tracktown premiered at the 2016 LA Film Festival, little did they know the film would result in an unprecedented invitation to make their next project on the (very cold) ground, smack in the middle of the 2018 Winter Games in Pyeongchang, South Korea—part of the International Olympic Committee’s new artist in residency program launched in 2016. The result is Olympic Dreams, a series of five episodic shorts that mine the Greek-American Pappas’s own IRL experience as an Olympic long-distance runner (for the Greek team) at the 2016 Summer Olympics in Rio. The project stars Pappas as Penelope, a cross-country skier navigating her very first Olympic games, and Nick Kroll as Ezra, a volunteer dentist in the Olympic village who begins to develop a relationship with Penelope over the course of a few days. The result is an elite-athlete spin on Lost in Translation, mixing narrative with documentary to capture a vérité look at the Olympics from the inside. For the shoot, Pappas and Teicher were granted record-breaking access, filming in locations that no other non-IOC member has ever brought a camera into before. The project was also a huge leap of faith for the veteran comedian and actor Kroll, who went directly from being part of a literal three-person film crew in South Korea to hosting the 2018 Film Independent Spirit Awards alongside John Mulaney in LA mere days later. We recently spoke to Pappas and Teicher about their Olympic Dreams adventure, reaching the filmmakers from Mammoth, where Pappas is currently training for the 2020 Summer Games. Olympic Dreams is now available at Olympics.org. I read that the president of the IOC saw Tracktown on an airplane and that’s how he got the idea to reach out to you, correct? Teicher: In a lot of ways, Olympic Dreams began at the 2016 LA Film Festival where we world-premiered Tracktown. A year later the film got distributed and eventually ended up on an airline, which is where Paul Thomas Anderson saw it. But another person who saw it was Thomas Bach, president of the International Olympic Committee. He really loved how Tracktown is really about the experience of being an Olympic hopeful. He also loved how we blended fiction with reality, using real athletes alongside professional actors—Alexi, of course, being the intersection of that: an Olympian and a professional actor. The IOC has started this new artists in residence program. They find artists and they bring them out to be inspired by the games and make projects in their mediums. Pappas: He was like, what are you doing in February? How do you feel about coming to South Korea to make a film project of your choice? We were so excited. We went back to the drawing board and watched some of our favorite movies for inspiration. One of the movies we watched was Lost in Translation, which is about these two people who sort of have this special wrinkle in time together. So Penelope and Ezra were born. Penelope, played by myself, is a cross-country skier who’s going to be in her first Olympics. Ezra is a volunteer dentist, inspired by my experience in Rio at my first Olympics, where I met a volunteer doctor and he asked me out. So it does happen! Jeremy and I sat down and came up with as detailed a “scriptment,” which I guess is what we called it. So we went there with an idea of a structure, but one that allowed for discovery and really relied heavily on improv, which is why Nick Kroll was such a wonderful teammate. Teicher: We made sure that we were flexible enough to be inspired by what we saw on the ground, to show the Olympics in a different way. It was very unprecedented, the access we had. We were in the real athletes’ village, we were in competition venues; a project like this has never been done before. How did Nick Kroll get involved? He went directly from the Olympics to co-hosting the Film Independent Spirit Awards here in LA. Pappas: We were watching [the Spirit Awards] huddled up in sweat pants, back in training mode in Mammoth, and Jeremy made an observation that a week before Nick was carrying sound equipment and mic’ing himself up in, like, a cold ski jumping center in South Korea. And here he is a week later, in a tuxedo hosting the Spirit Awards. Nick grew up watching the Olympics and saw this as a rare opportunity to have this access and create a film in areas where no non-Olympic athlete has ever been able to have a camera. He saw some of the feedback we had gotten off Tracktown, and really committed. Was he someone you already had in mind for this? Teicher: We had a vision for what we wanted Ezra to look like, what we wanted his essence to be, and Nick certainly was on our short list. Nick also shares writing credit. We had a scriptment, but we used improv so much to get from A to B, and along the way we made discoveries that altered the structure of the story. Just the way he was talking about it, you could tell he had a producers’ eye and just a real independent filmmaker’s instinct. What were your days like? Pappas: Every day, we would wake up and I would do my training in the morning. So we wouldn’t get out into shooting until about 10:00 or 11:00 when we got to set, which could mean any number of things—whether it was the Olympic village or the cross-country ski center or the curling center. Then we would be on our feet and shooting with all the costumes, all the sound equipment, makeup, lights. Everything was on our person at all times. We would shoot until nine-ish every night and get back, find some nice Korean noodles and then get to bed. Teicher: We were limited in terms of the number of people we could bring, so I needed to be able to be a one-man band. I spoke to a bunch of cinematographer friends and landed on a camera, the Panasonic EVA1. I consulted with documentary filmmakers, because they’re used to being one-person shops. Then I talked to my sound designer, Nathan Ruyle, and we designed what Nathan claims is the most sophisticated one-person sound setup in the world. And luckily we made friends with the Team USA bobsled team’s chiropractor and I saw him every couple of days, which kept me on my feet for sure. Pappas: As actors, I think Nick and I felt a really great trust in Jeremy. Jeremy was so in his zone with what he wanted. I always felt like I was safe to play and that when he liked something, he would draw it out of us more. Teicher: As much as Alexi and Nick had trust in me, I also trusted them. We would know what needed to happen at the end of a scene, so we would find that piece within it and we’d run it as a rehearsal. So sometimes by take five, it’d be a different scene than take one, and that take five would become take one of what the scene was actually supposed to be. Lastly, tell us a little bit about some of the real-life athletes who are in the show. Pappas: I would just approach athletes and introduce myself as a summer Olympian who was making this artist in residency film project with Nick Kroll. All of the athletes, unless they were competing literally that day, were thrilled to do a cameo with Nick or myself. The one athlete I enjoyed meeting in particular was Gus Kenworthy, who was a medalist in freestyle skiing. We got in touch with him ahead of time because I had learned that he was an athlete who, like myself, wants to be an actor when he hangs up his competitive Olympic skis. So he plays a larger cameo, more like a regular speaking role. Teicher: It was really leveraging that experience from Tracktown that [we] had of working with real people and involving them in fictional scenes. It’s an interesting balance of setting up a fictional framework to fit the scene and then enabling the athlete to be themselves within that fictional setup, just keying into who they are and letting their actor bounce off of that. To watch the complete run of Olympic Dreams, please visit Olympics.org. And to learn more, you can follow Alexi Pappas on Instagram here and Jeremy Teicher here. And read our 2017 interview about Tracktown here. Learn how to become a Member of Film Independent by visiting our website. Be sure to follow us on Twitter, Facebook and Instagram and don’t forget to subscribe to Film Independent’s YouTube channel.